Fresh from his win with Craig Lowndes in the Bathurst 1000 on Sunday, Steven Richards is looking forward to chasing more titles at the Laser Plumbing & Electrical Hampton Downs 500 this weekend. Two Australian GT crowns will be decided at Hampton Downs with Richards lying third in both the Australian GT Championship, one of the oldest and most prestigious titles in Australian motor racing, and the Australian Endurance Championship. 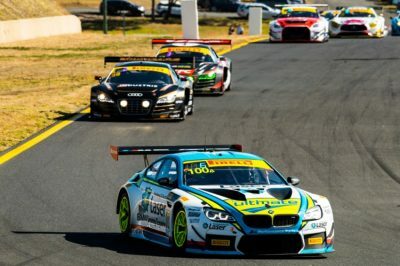 “Bathurst is the biggest motor race in the Southern Hemisphere so to stand on the top step of the podium there means I’ll be going to Hampton Downs with a big grin on my face,” says Richards. It was Richards’ fifth win in The Great Race, but it was a win that looked very unlikely after a tough time in practice and qualifying. “If you had asked me on Sunday morning how likely a win was for us I would have said we were an outside chance at best,” he says. “We had a lot of steering issues with the car over the weekend and it took a monster effort from the team to resolve the problem. They really only got to the bottom of it on the morning of the race. Fraser Ross currently leads the Australian GT Championship in the McLaren. Ross has been the most consistent driver all season and holds a 16-point advantage over second placed Peter Hackett, but with 320 points up for grabs, none of the top eight in the standings can be ruled out. Hackett won the Hampton Downs 500 last year with Kiwi ace Dominic Storey and the veteran Australian driver has come agonizingly close to winning the Australian GT Championship countless times before. This could be his year. Richards is just 35 points off the championship lead going into the last race of the season. Last year’s championship winner, Geoff Emery, is also still firmly in contention along with Tony Bates – who teams up with Kiwi driver Daniel Gaunt – and Liam Talbot who has championship winning experience in Europe. Paired with Kiwi legend Craig Baird, they’re a race winning combination, and while the title might be a stretch it remains a possibility. The Australian Endurance Championship is also balanced on a knife-edge with four driving pairings in with a realistic shot at claiming the crown. A stunning season from Max Twigg and Tony D’Alberto sees them heading the charge while chasing them hard are Richards and Almond and Bates and Gaunt. Tony Quinn has shown some pace in the Aston Martin Vantage GT3 in the South Island Endurance Series in recent weeks and he’ll team up with Highlands professional driver Andrew Waite. The other New Zealand entry in the field is Andrew Fawcett and Jonny Reid in the Audi R8 LMS. The support categories at Hampton Downs include Central Muscle Cars, BMW Race Driver Series, Pirelli Porsche Championship, and the Ssangyong Actyon Racing Series.